I just found a whole bunch of plane tickets that only have a start and destination on them. I also know the route started in a certain city. I would like to recover the (alphabetically) first possible route a person took using these tickets. I added some examples in the doctests. '''Reassembles a series of flights. Since this is really a graph problem, it would make things clearer if the code used graph terminology rather than flight terminology. Thus: FlightStorage → Graph, start → vertex (or node), destination → neighbour, list → neighbours, flights → edges and so on. 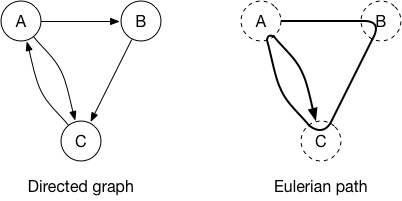 The reason for using graph terminology (rather than flight ticket terminology) is that there is a body of computer science literature about graphs, and translating your problem into graph terminology helps you to see how your problem relates to this body of literature, and helps you discover and implement the best data structures and algorithms for your problem. The classes OrderedDefaultDict and FlightStorage lack docstrings. the loop is modifying the dictionary storage.storage at the same time as it is iterating over it. This is not guaranteed to work in Python (though it might happen to do so in some cases). For reliability you need to avoid this. In the remove method there ought to be a check that self.storage[start][destination] is greater than zero, before decrementing it. This would catch attempts to remove non-existent edges from the graph. The test not any(storage.list(start)) only works if the vertices of the graph are represented by objects that test as true. This prevents us from (say) representing vertices as integers starting at zero (because vertex zero will test as false). In any case there is no need for the special case if not any(storage.list(start)) because that is already handled correctly — if start has no neighbours then there will be no iterations of the for loop. Returning None when the graph has no Eulerian path is risky. It would be easy for caller to forget to check. It is better to raise an exception in an exceptional case like this. When constructing the graph, it would be faster to sort the neighbours of each vertex, rather than sorting all the edges in one big list. In order to ensure that this procedure yields the lexicographically first path, we need to take some care about the order we choose edges and vertices. In particular, when following edges, we should choose the unused edge to the lexicographically earliest neighbour, and when choosing a vertex with unused edges, we should choose the last such vertex along the path constructed so far. This uses a linked list to maintain the path, so that we can efficiently insert new vertices into the middle of the path as we go along. The graph itself is represented as a defaultdict(list) mapping each vertex to a list of its neighbours. The neighbours for each vertex are sorted into reverse order, so that when we pop the list we get the lexicographically smallest neighbour. "A link in a linked list." "Insert link after self in the linked list and return link." If the graph has no Eulerian path, raise ValueError. # Sort neighbours of each vertex in reverse order. start = Link(start)    # First vertex on the Eulerian path. unvisited = [start]    # Stack of vertices that might have unvisited edges. # Follow edges until a dead end is reached. # Each dead end (except possibly the first) must complete a loop. # All edges must be traversed. # Reconstruct path from linked list. Hierholzer's algorithm requires no backtracking, and solves the problem in time that's linear in the size of the graph. Whereas the code in the post potentially follows all simple paths in the graph, and in the worst cases takes time that's exponential in the size of the graph. Here's one way to generate some test graphs that demonstrate the problem. "Generate edges in a test graph with n vertices." Not the answer you're looking for? Browse other questions tagged python algorithm python-3.x programming-challenge backtracking or ask your own question.